July 6, 2013, Saanich, BC (ISN) – After a successful 2012-2013 season that saw the Saanich Braves finish as one of the top two teams in the VIJHL, as well as graduate a number of players on to the next levels of Junior or College hockey, the Saanich Junior B hockey club has begun its quest for new talent and is holding their 2013 Prospects Camp this weekend at Pearkes Arena in Saanich. For Saanich Braves Head Coach Brad Cook, success is not always measured in the win column, but instead, especially for a development league like the Vancouver Island Junior Hockey League, in how many players the team can move on to the next level of hockey, namely Junior A or higher, or college opportunities in Canada or the U.S. Using that benchmark, Cook, now heading into the third year of his recent tenure behind the bench with the Braves, is well on his way to meeting that standard. At least five of his players from last season (with possibly more to come) have committed to play at the Junior A level, or at U.S. colleges this fall. Leading the charge is 2012-2013 Captain and Braves leading scorer Ty Jones, who is headed to the University of Oklahoma. Gritty forwards Sam Johnston and Justin Polischuck are off to Michigan where they will both be joining the ranks of the Adrian College Bulldogs in the American Collegiate Hockey Association (ACHA). 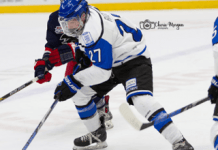 Rear guard Chad Roorda is also joining an ACHA school as he is headed to play at Central Oklahoma University and Saanich Minor Hockey product Shawn McBride has signed to play at the Junior A level with the Victoria Grizzlies in the BCHL. The success of moving players up a level is a bit of a double-edged sword for teams in the VIJHL, as it means there are gaps to fill each season, but it is what teams strive for. Speaking of those “someone else’s” there are four teams worth of skaters and goalies looking to impress Cook and the rest of the Brave’s coaching staff at the Prospect Camp this weekend. On Friday, all four teams were put through practice sessions and on Saturday morning, they all played their first games. While the play was pretty much expected for a spring/summer camp where many players may not be familiar with each other, Cook noted that there were some positives. While Cook would not commit to mentioning any one player or players that were jumping out so far, he did allude to the fact that there are certain kids on his radar that he hopes will stand out from the crowd. The players will have that opportunity throughout the rest of the camp which continues with games Saturday afternoon at 4:30 pm and in the evening at 6:00 pm. On Sunday, the final two games go at 11:00 am and 1:00 pm. All games are at Pearkes Arena in Saanich. Following the games, all players will be interviewed by the coaches and a number will hope to be invited back to main camp in August where they will continue on with their quest to join the club for the 2013-2014 season.